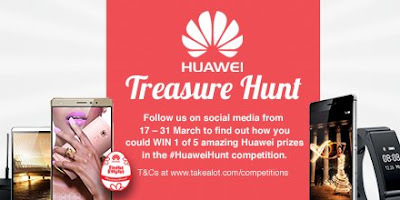 The Huawei Consumer Business Group (BG) sprung another surprise and proudly announced their partnership with Takealot on a digital Easter treasure hunt. The treasure hunt is live from today and runs until the 31st of March 2016 on Takealot.com. Consumers need to spot the Easter egg image on a product in the Huawei catalogue. Consumers then need to share that product link on social media and need to tag Takealot and include the hashtag, #HuaweiHunt. A winner will be randomly selected from all valid entries on the day and notified the following day. “Our national Easter treasure hunt is running at the moment and we wanted to spread the love to our online community. The partnership between Takealot is a valued partnership that we hope will be the start of many exciting things to come in future”, said Charlene Munilall, the Huawei General Manager Consumer Business Group South Africa.